For over a decade I’ve helped build brand platforms and visual identity systems internally. It’s very different from working on the agency side. Being on the ground, I have the privilege to see what works and what doesn’t on a daily basis. I’ve also gained a lot of experience making business cases for using design as an approach to solving real problems. Overall it has made me a more strategic and thoughtful design professional. Here are some examples of how I problem solve with design. For the last several years I’ve helped build brand platforms and visual identity systems internally. It’s a very different environment and experience from working on the agency side. You’re there on ground and have the privilege to see what works and what doesn’t on a daily basis. You also gain a lot of experience making business cases for design as an approach to solving real problems. Overall it has made me a more strategic and thoughtful design professional. Here are some examples of the how I problem solve with design. 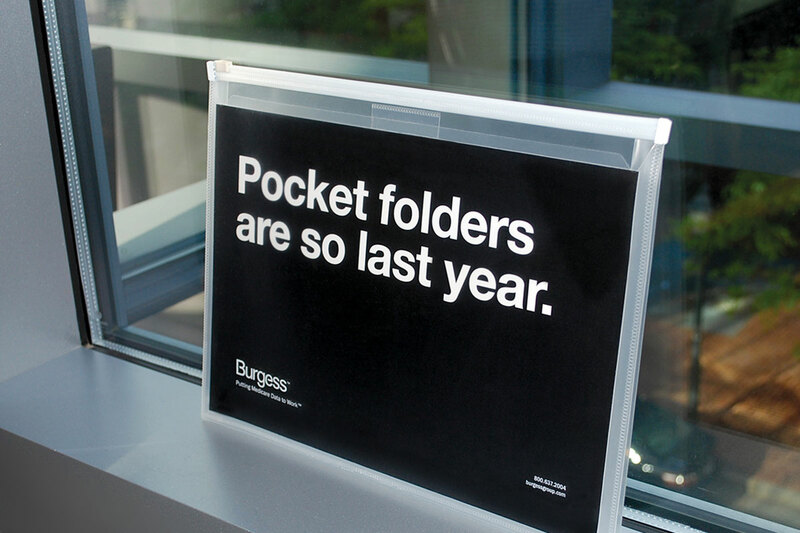 To avoid the impersonal effect of using one generic pocket folder for a variety of interactions. A transparent polypropylene envelope with a zip top closure, expandable gusset and front slip pocket was produced. The front slip pocket allowed for different covers to be inserted easily. It was custom printed with the company logo and contact information so it would remain branded even when cover inserts were taken out and used to carry other items.